What do I have to do to join the ring? or it must be a non-game-specific Palladium or general role-playing site. If your site is a dedicated to multiple games (for instance, if it has material for both Rifts and Heroes Unlimited), it may be allowed, as long as it has a respectable amount of information related to one or more of the above games. You must have actual content on your site. A list of links, or a page stating what you plan to add someday, is not going to cut it. Ideally, you should have at least five original, game-related files, but this requirement is flexible. Some people prefer to have lots of little files, others prefer to have just a few big ones. As long as there's content on the site, you're fine. The site must be non-commercial in nature. If you want to sell music, books, babies, or whatever through a link on your site (well, okay, maybe not the babies), that's fine. If the sole purpose of your site is to generate revenue (for instance, it's an on-line game store), that's not fine. It must contain no racism, hate-mongering, gender-bashing, extreme profanity (a little is okay), or pornographic material. Try to keep things PG-13 -- R-rated sites may be allowed, but if they are, it will be on a case-by-case basis. The site must look good and run well. You don't have to have pefect, professional-quality graphics and Shockwave games on every page, but make sure the site is readable, presentable, and easy to navigate. "Broken" links and graphics are not acceptable. If I can't read any of your text because of your background, you need to change something. Also, please try to check your spelling. A few typos are okay, but gross misspellings of important words make things incredibly difficult to read. Plus, there are some misspellings that I, personally, find annoying to no end. If you have a Heroes Unlimited site, but you can't correctly pluralize the word "hero," I'm going to get annoyed, and if I'm in a bad mood, I won't let in your site. For the record, it's spelled "Heroes." Note the fact that, since "Hero" ends in a vowel, an "es" is added, not just an "s."
If you don't believe me, check the cover of the book. The S.D.C. Ring is for the Palladium RPG's that don't get a lot of exposure. I, as Ringmaster, also reserve the right to choose not to admit any site, for any reason. Basically, these requirements are in place to make sure the S.D.C. Ring stays true to its goal -- to provide a way for Palladium's lower-profile games to get noticed. 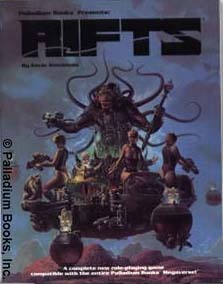 Rifts: There are a few WebRings dedicated just to Rifts. Everybody and his friggin' brother has a Rifts page, so Rifts is pathetically easy to find on the Internet. If allowed into this Ring, Rifts would overrun everything else and it would be impossible to find non-Rifts content, just like on every other Ring out there, not to mention link lists, search engines, and every other tool I've ever tried to use to find RPG content. This is exactly what the S.D.C. Ring was created to avoid (That's right, kids: it's all Rifts' fault!). Palladium Fantasy RPG: This one could theoretically be included, but it's a bit more "high-profile" than the games that are allowed, being the other game that occasionally see the release of more than one sourcebook a year from Palladium. In addition, it is set apart by not taking place in the real world (or at least a resonable facsimile); it has its own world. Plus, it has a couple of WebRings of its own. it's a different animal than the games this Ring is dedicated to. Robotech/Macross II: These two introduced the concept of M.D.C., so including them would not only be against what the S.D.C. Ring stands for (though I would like to point out that the S.D.C. Ring is not simply intended to be an "M.D.C.-free" Ring -- It's intended to focus on Palladium's "S.D.C." games. And yes, there is a difference., it would be blatantly hypocritical. And again, they do not take place in the "real" world like the others do.